Sometimes all you need is a name on a flier to have a band. Just ask Joyce Manor, a band conceived of in the back seat of a car parked at Disneyland in 2008. 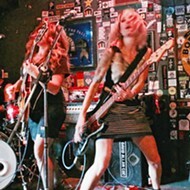 In press materials, co-founders Barry Johnson (guitar, vocals) and Chase Knobbe (guitar) explained that they were sharing a bottle of cheap booze when they thought it’d be awesome to have a “power violence” band where every member had a glam name in the vein of “Johnny Thunders,” and Johnson took the moniker Joyce Manor after an apartment he frequently walked by. MORE PUNK THAN YOU: Joyce Manor brings their infectious punk sounds to the Fremont Theater on April 6. That first opening gig, they performed as a duo, but they soon discovered they were a “pop-punk band trapped inside a folk-punk duo—too many songs just demanded bass and drums. Playing loud is just more fun,” Johnson explained. By the end of 2009, they’d added drummer Kurt Walcher and welcomed old friend Matt Ebert back from Portland to play bass. 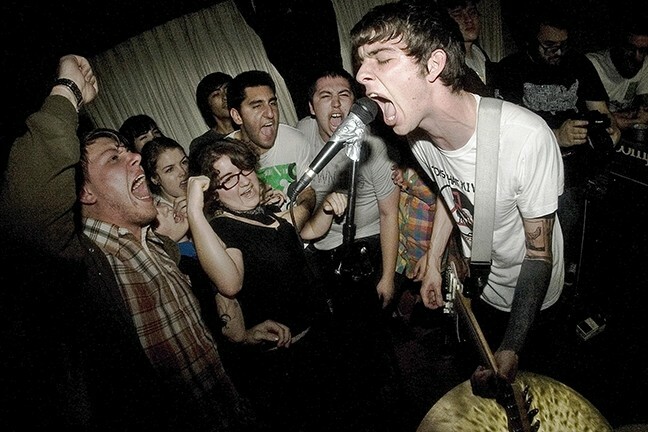 See Joyce Manor and opening act Tijuana Panthers when they play a Numbskull and Good Medicine show this Thursday, April 6 (7 p.m.; all ages; $18 at Boo Boo’s or ticketfly.com or $20 at the door), at the Fremont Theater. LADIES RULE! : SLOfolks has Nina Gerber and Chris Webster (left) playing April 7 at Coalesce, joined by Pam Delgado and Jeri Jones (right) on April 8 at Castoro Cellars. SLOfolks has two amazing shows cooked up for you this weekend when they bring Nina Gerber and Chris Webster (on Friday and Saturday) plus the Pam and Jeri show with Pam Delgado and Jeri Jones of Blame Sally (on Saturday)! That’s a lot of potent female-centric talent let loose on stage! See Nina and Chris on Friday, April 7, at Coalesce Bookstore (7 p.m.; all ages; $20 at 772-2880); and all four on Saturday, April 8, at Castoro Cellars (7:30 p.m.; all ages; $20 at 238-0723, online at castorocellars.com, or at Boo Boo Records). “Seldom do we have the opportunity to bring such a breathtaking collaboration of musical talent to our stage,” SLOfolks President David Arndt said. “Our Friday show features Nina and Chris, two absolute masters of what can best be described as acoustic folk-rock. Nina likely needs no introduction—she’s built a reputation playing guitar with and for a host of folk luminaries too long to list. 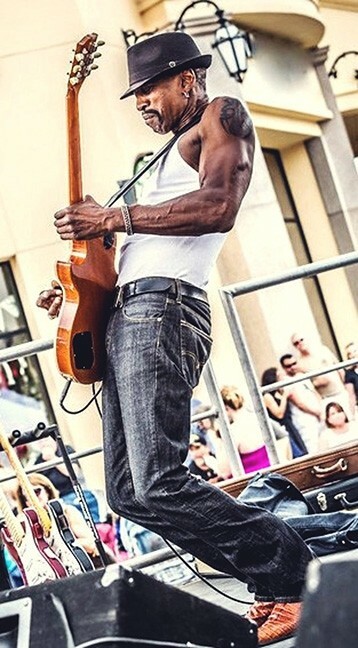 Chris is an award-winning soul singer (and lead singer for Sacramento’s Mumbo Gumbo) who stretches the genre to cover folk, gospel, blues, bluegrass, and more. Together these two just released a new album—Apple Blossom Lane—that is quite awesome. COWBOY UP! 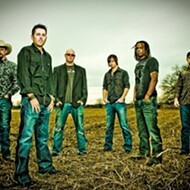 : The Chancey Williams Band with Callie Twisselman plays SLO Brew on April 6 for a Cal Poly Rodeo kickoff party. SLO Brew hosts a Cal Poly Rodeo kickoff party on Thursday, April 6 (10 p.m.; 21-and-older; $10 at ticketweb.com), featuring the Chancey Williams Band with Callie Twisselman. Listen to some great country music from a Wyoming native who’s lived the cowboy lifestyle. Proceeds go to support the Cal Poly Rodeo. American roots and blues act Orphan Jon & The Abandoned play Frog and Peach this Thursday, April 6 (10 p.m.; 21-and-older; free). Get a dose of authentic, dirty, raw blues played by guys who know how to do it! Opera Santa Barbara’s popular Noontime Concert series is expanding into SLO County this Sunday, April 7, when they play a free noon concert at SLO’s First Presbyterian Church on the corner of Marsh and Morro streets (noon, all ages; free). 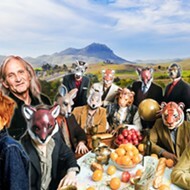 Enjoy popular and lesser-known operatic arias and duets as well as previews of upcoming Opera Santa Barbara performances. Fair trade coffee, tea, and chocolate available for purchase. Toro Creek Event Center at The Last Stage West presents Native American frontman Cody Blackbird and his band, with special guest Kenny Lee Lewis (the Steve Miller Band) sitting in on a few tunes, this Friday, April 7 (6 p.m.; all ages; $15 presale at 792-0505 or $20 at the door). 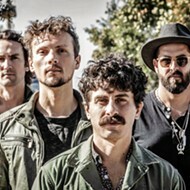 “Blending the old with the new, Cody merges the Native American flute with powerful vocals into contemporary blues rock sounds with The Cody Blackbird Band,” according to press materials. NATIVE AMERICAN SOUNDS: The Cody Blackbird Band plays April 7 at Toro Creek Event Center at The Last Stage West. The Cal Poly Music Department will present an Open House Recital this Saturday, April 8, in Room 218 of the Davidson Music Center (No. 45) on campus (2 p.m.; all ages; free). Expect performances by a clarinet and strings quintet, a clarinet trio, a woodwind quintet, a saxophone quartet, and a brass quintet and percussion ensemble. Singer-songwriter Rowan McGuire brings his original sounds to Linnaea’s Café this Saturday, April 8 (7:30 p.m.; all ages; pass-the-hat). 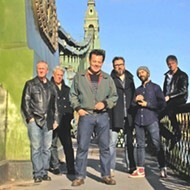 McGuire’s music is influenced by John Mayer, Ben Howard, John Martyn, Nick Drake, and Tommy Emmanuel. There may be a few tickets left for the Clark Center’s presentation of Jim Curry: A Tribute to the Music of John Denver this Saturday, April 8 (8 p.m.; all ages; $39 to $45 at 489-9444). Curry, whose voice was heard in the CBS-TV movie Take Me Home: The John Denver Story, has performed Denver’s music in sold-out shows throughout the country. SIZZLING GUITAR SOLOS: The San Luis Obispo Blues Society presents the Dennis Jones Band on April 8 at the SLO Vets Hall. Argentine tango band, TangoBC Trio, plays the SLO Guild Hall this Saturday, April 8, as part of La Milonguita—a tango social dance—that occurs on the second Saturday every month (doors as 8:30 p.m.; all ages; $20 at the door; reduced prices online at squareup.com/store/la-milonguita). Reservations are recommended. The SLO County Jazz Federation presents its annual Young Jazz Scholarship Concert on Sunday, April 9, in the Steynberg Gallery (4 p.m.; all ages; free). This year’s scholarship recipients are Cuesta College students Talia Ortega (flute), Tom Brown (drums), Lia Fagan (vocals), Spencer Hutton (bass), Ian Skinner (trumpet), and bassist James Gallardo from Cal Poly. Gary Drysdale (guitar), Matthew Evans (bass), and Dean Giles (drums) provide rhythm support. The Matthew Taylor Memorial Trust sponsors this event. Alluvion (aka Berndt Evenson), an electronica “one-man-band” from Northfield, Minn., plays Last Stage West this Sunday, April 9 (6 p.m.; all ages; call 461-1393 for more info). With an electric guitar, live midi tweaking, analogue ribbon improvisation, and heavily effect-driven layered vocals, Alluvion creates a tripped-out electro-garage sound. 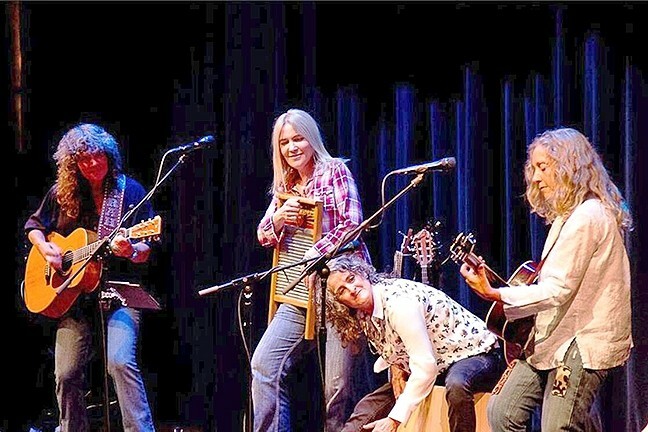 Local award winning Americana act the Noach Tangeras Band plays SLO Brew’s Pint Night on Tuesday, April 11 (10 p.m.; 21-and-older; free). Tangeras writes emotionally potent songs and has an arresting voice, backed by a great band. Up and coming band Up! Way Up! brings its blend of ’60s-inspired rock, ska, and reggae to the Frog and Peach this Tuesday, April 11 (10 p.m.; 21-and-older; free). The Bogeys open. “We’re an aspiring rock trio comprised of three Cal Poly seniors and have been playing lots around the area, most recently at Tap It Brewery, the UU Plaza at Poly, and Mongo’s Saloon in Grover,” band member Ryan Corvese said. “We incorporate all three of us into the vocal mix.” Check them out on Tuesday or catch them on Friday, April 14, in Morro Bay’s newest club, The Siren. PHOTO COURTESY OF UP! WAY UP! UP AND COMERS: Up! 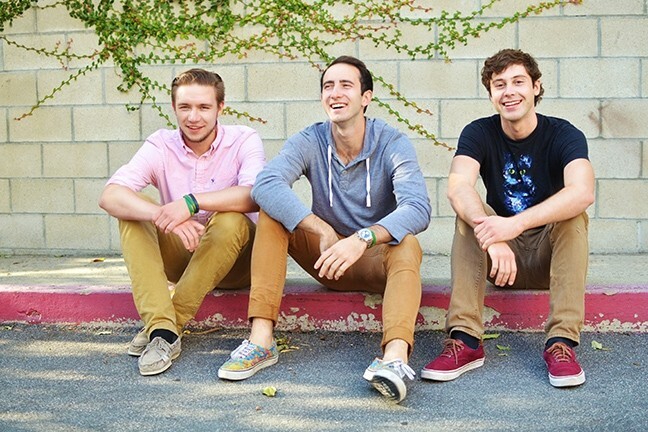 Way Up!, a trio of Cal Poly seniors playing ’60s-style rock, ska, and reggae, play Frog and Peach on April 11. Rebel Souljahz brings their soulful reggae and harmony vocals to SLO Brew on Wednesday, April 12 (10 p.m.; 18-and-older; $17 at ticketweb.com). Hailing from the urban streets of Waipahu, Hawaii, they formed in 2006 and have toured 18 countries and performed before crowd as large as 15,000-plus! 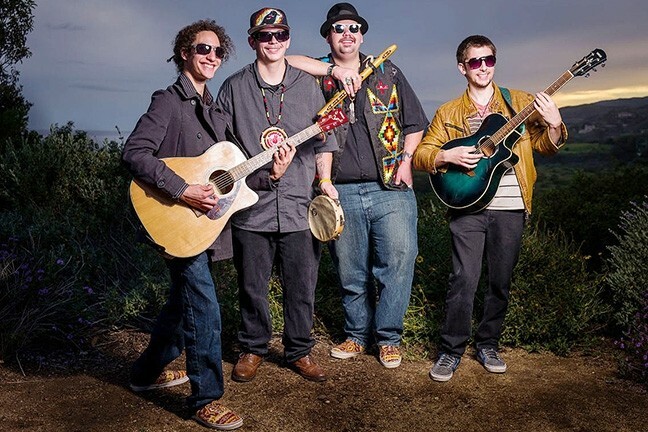 One of the Bay Area’s best reggae bands, the sassily named IrieFuse, plays the Frog and Peach on Wednesday, April 12 (10 p.m.; 21-and-older; free). This is classic reggae by a band that’s performed with Barrington Levy, Richie Spice, Alborosie, Don Carlos, Anthony B, Israel Vibrations, Morgan Heritage, Sly & Robbie, Yellow Man, Sizzla Kalonji, Junior Reid, Mikey General, Tomorrows Bad Seeds, The Expendables, and Josh Heinrichs. Honkytonk artist Trevor McSpadden, former frontman for The Hoyle Brothers, plays three shows this week to promote his new album Let’s Fall Together: Wednesday, April 12, at Sculpterra Winery (6 p.m.; $15); Thursday, April 13, at Otter Rock Café (6:30 p.m.; free); and Friday, April 14, at The Pour House (8:30 p.m.; free). The Central Coast Guitar Show returns on Saturday, April 8, in the SLO Guild Hall (10 a.m. to 2 p.m.; all ages; $5 admission, $1 off if you walk in with an instrument to sell or trade). The point of the event is to buy, sell, trade, and see all things guitar—new, used, and vintage—as well as other musical instruments and services. Plenty of manufacturers, vendors, and musicians will be on hand. The door prize is an Epiphone Les Paul Junior guitar! Email centralcoastguitarshow@charter.net for more info.